South Africa's ex-President Thabo Mbeki has called for a boycott of Israeli goods to show solidarity with Palestinians. The public should mobilise against Israel so that it "does pay a price for the position that it is taking", Mr Mbeki said in the capital, Pretoria. About 2,000 people, mostly Palestinians, have died in the conflict in Gaza since July. Most South Africans have historically supported the Palestinians. BBC South Africa analyst Farouk Chothia says they include the country's first black president - the late Nelson Mandela - Nobel peace laureate Archbishop Desmond Tutu and prominent Jewish leaders such as Ronnie Kasrils and the late Joe Slovo. They drew parallels between the anti-apartheid struggle in South Africa and the Palestinian campaign for independence, he says. 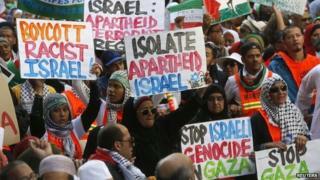 However, South Africa has a vocal minority which supports Israel and believe that it is unfairly maligned. Meanwhile, a row has broken out after the Jewish deputy head boy of Johannesburg's King David Victory Park School, Joshua Broomberg, appeared in a photo posted on Facebook wearing a Palestinian scarf. Hundreds of people signed an online petition demanding that he be stripped of his school honours. Mr Kasrils described the petition as "disgraceful", and said Joshua Broomberg was made of "sterling stuff", South Africa's privately owned Eyewitness News reports. The schoolboy appeared in a photo with two other students, and a counter petition has been launched to rally support for them, it reports. Mr Mbeki, in an address to students at the University of South Africa, rejected calls for the government to recall its ambassador to Tel Aviv, saying South Africa needed to "engage" with Israel to find a "just solution" to the conflict. At the same time, South Africa's political parties, trade unions and religious groups should mobilise for a boycott of Israeli goods and "divesting" from Israeli companies, he said. "It is not the responsibility of government to mobilise people. We must mobilise ourselves."